When Karen shared this recipe on her blog, Hopelessly Ordinary I copied it so I could try it. 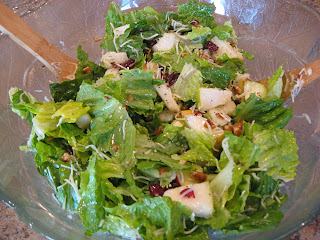 Then several ladies from the Sonlight Forums raved about how good this salad of Karen’s is. Boy, were they right! The flavor combinations are wonderful. 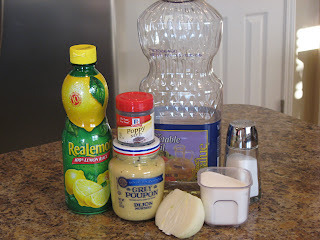 Whisk the sugar, lemon juice, onion, mustard and salt together. Whisk in the oil in a slow stream and then stir in the poppy seeds. Or just put all the ingredients in a container with a tight fitting lid and shake the daylights out of it. 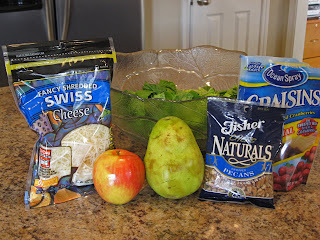 Put all that together in a salad bowl and toss with the dressing. Karen peels the fruit, but I left the skins on. This tasted great with grilled chicken. Mmmmmm! Okay, every blogger is torturing me tonight with awesome food recipes! That looks really good. I’ll have to pick up the ingredients next time I’m at the store. I think it would be great with that apple chicken recipe you posted awhile back. BTW- the apple with baked chicken was delicious. Everyone in my family loved it! Robin, it’s 1/2 cup. I fixed it in the recipe. Sorry! I’m just so glad that you guys liked it! It’s our favorite. i dont like salad. but you all make this sound delicious. Thanks so much for stopping by!!! 🙂 Hope to see you back again soon! What a wonderful refreshing salad! I love all of the flavors! I’ve seen your blog before! I love your recipes. I “created” something similar to this, but a lot more lazy. Jaci, that sounds good. I’m all for shortcuts, because sometimes I’m just in a hurry! Thanks for sharing! ooo that looks and sounds wonderful! i love salads! can’t wait to try it!! thank you visiting my blog!! Oh yummy, this sounds so good!! I just LOVE salads and this looks like something to try! The salad looks wonderful. 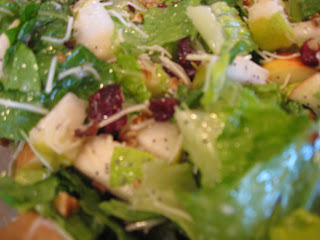 I have in the past used a Sweet Onion Dressing to give a similar salad s little bit more creamy flavor. I’ll have to try it this way as well. I just made this tonight and my husband thought it was the best salad I’ve ever made next to my strawberry spinach salad. I found turkey ham steaks, which the kids loved ! And I also found an instant roll recipe on allrecipes.com! My oldest ate the salad, other 2 only ate a little. I used almonds instead of the cashews.